Home→Archive→Belfast Flying Shoes presents “The Dancingmaster”, May 20 in Brooks! ← MAINE FIDDLE CAMP HARMONICA IN JUNE!! A one-of-a-kind theater and dance event, “The Dancingmaster” is a whimsical musical portrait of the contra dance caller, Dudley Laufman. The charismatic figure at the center of a dance revival in the late 1960s and 1970s, Laufman had a profound influence in Maine. 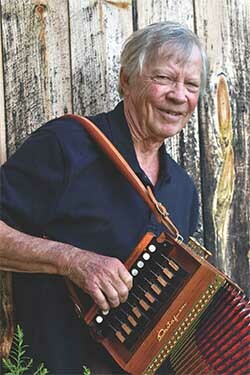 His work with the Canterbury Country Dance Orchestra inspired the musicians and callers who formed both the Maine Country Dance Orchestra, whose Bowdoinham dances were legendary, and Maine Fiddle Camp, now in its 24th year. Dubbed a folk operetta, “The Dancingmaster” is the latest of composer Lawrence Siegel’s acclaimed “Verbatim Projects” and features verbatim words and lyrics from an interview that Siegel conducted with Laufman. Keith Murphy, the highly-regarded traditional musician and singer from Vermont, brings his warm tenor voice to his portrayal of the character “Dudley,” and is joined by Becky Tracy on violin and Larry Siegel on piano. An intergenerational group of local dancers will offer a visual complement to the singing and instrumental music. “The Dancingmaster” will appeal to fans of traditional music and dance, as well as those who love musical theater and classical music. Belfast Flying Shoes board member, Chrissy Fowler elaborates, “We’re thrilled to stage ‘The Dancingmaster’ in Maine. We’ve brought in Molly Gawler of Monroe to create original choreography for an inter-generational group of local dancers. As a professional dancer with a family background in traditional dance & music, Molly is a perfect fit. Having Dudley on hand to call the dance after the performance makes it all the more special.” The Waldo County Country Dance Orchestra is an open ensemble patterned after Laufman’s legendary Canterbury Country Dance Orchestra and the Belfast Flying Shoes All Comers Band. All musicians are welcome to sit in with Tracy, Murphy, and Siegel as Dudley leads the dancing.